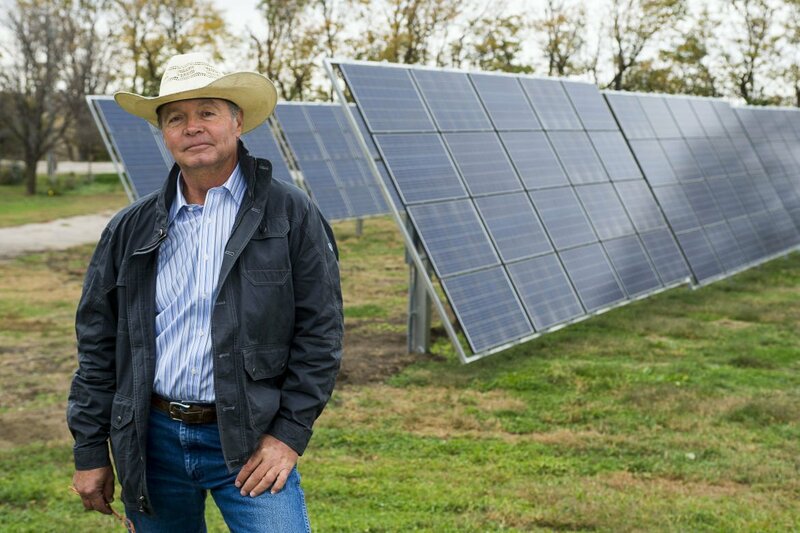 Rick Hammond has flipped the switch on his new 25-kilowatt solar array, which will power his farm operation west of Benedict. 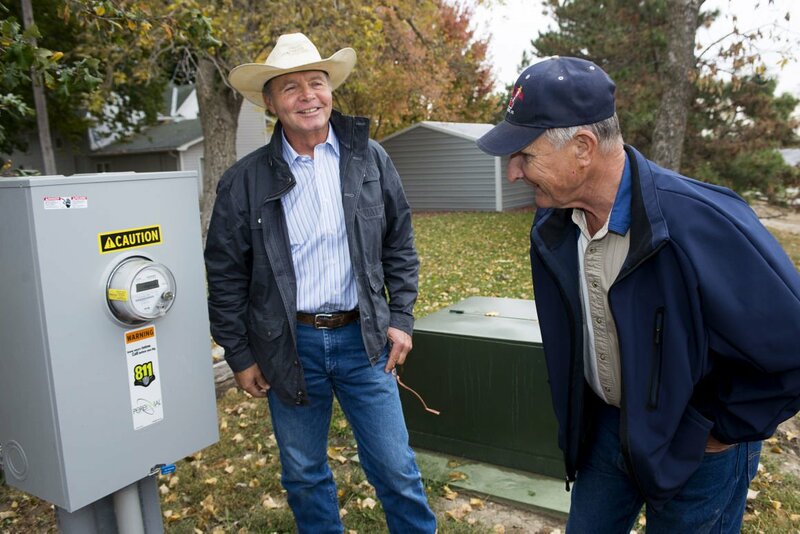 Rick Hammond (left) and Jim Knopik watch the meter Thursday after Hammond powered up his solar array, which Knopik helped install. Each of the 96 individual solar panels has its own power inverter on Rick Hammond's 25-kilowatt solar array. BENEDICT -- On Rick Hammond’s farm, between the gravel road on its east edge and the grain bins where he will store this year’s corn harvest, sit 96 solar panels mounted on two rows of gray metal frames. Each frame, 13 feet high and 28 feet long, runs east and west, supported on three legs made of 6-inch steel square tubes. On Thursday, the day after his 63rd birthday, Hammond stood a few feet away from the panels and pulled the switch on the side of a beige box. The digits on the nearby electrical meter, previously a line of zeros, began to change. He is one of a growing number of Nebraska farmers, homeowners and businesspeople who have sharpened their pencils, done some math and found small-scale solar arrays will save them money while reducing their carbon footprint. Solar panels have been installed on a growing number of farms and in fields, powering water pumps for livestock and center pivot irrigation systems for row crops, with the benefits of lower installation costs, improved performance, grants and tax breaks. Hammond’s panels will help power the aeration units that dry the corn in his bins, the electric tools in his shop and the house his hired man lives in. When they produce more than the farm is using, the energy will be fed into Perennial Public Power District’s grid and help power his neighbors. When the sun isn’t shining or the farm is using more electricity than the solar panels produce, the power company will provide electricity as normal. Then once a year, the power district will average out how much electricity Hammond has used. If he produced a surplus, he gets a check, although it likely would be a small check because the company buys that extra electricity at a wholesale price, which is much lower than the retail price for which it sells power. Putting up a solar system takes a fair amount of cash up front. Hammond’s array cost $84,864, but a combination of a USDA grant and federal tax credits brought the cost to him down to $19,100. His 25-kilowatt-hour solar system, which is guaranteed for 25 years, is expected to generate 37,440 kwh annually. At 8 cents per watt, that will save him about $3,000 a year, and the panels will pay for themselves in just over six years. Overall, solar power remains a small percentage of the total renewable energy produced in Nebraska. While the number of panels in the state is growing, it’s not clear by how much. No state agencies track them. Most people with solar panels sign up for what is called net metering, which means the power company agrees that the customer can produce electricity to offset their electric bill, and if the solar panels produce more than the customer uses, the power company will buy the extra electricity. The number of power customers signing up to generate their own electricity in the state has grown significantly in recent years, according to a net-meter report produced annually by the Nebraska Power Review Board. There were 253 customers signing up statewide this year, with a generating capacity of 1,733.28 kilowatt-hours, a drastic increase from only five years ago, when there were 45 with a capacity of 214.88 kwh. The report doesn’t break down the type of the generation, whether it’s solar, wind or another source. Martin Kleinschmit installed panels on his Hartington-area farm and ranch four years ago. He said he chose solar over a wind turbine because panels don’t make noise, they don’t require mechanical maintenance, and the panels and inverters are guaranteed for 25 years. “You just let them sit out there and they work,” Kleinschmit said during a recent interview. He liked the panels so much that he started a business with Belgrade farmer Jim Knopik to help other farmers, including Hammond, sift through the grant paperwork and get them built. On sunny days, Knopik said, he likes to sit and just watch the electric meter on his farm run in reverse. Nebraska utility companies have spent decades investing in and maintaining power plants, transmission lines, transformers, control systems and other infrastructure. To pay for that massive investment, they have to sell electricity. But at the same time, utilities find themselves facing both regulatory and consumer pressure to save power and use renewable sources, which means keeping peak usage under control. “By and large, the utilities are always promoting energy conservation and efficiency, which is kind of an interesting business model. There aren’t many businesses out there whose business model is to urge their customers to use less of their product,” said Shelley Sahling-Zart, vice president and general counsel for Lincoln Electric System and administrative coordinator for the Nebraska Power Association. One of the benefits of solar is that it produces the most when people are using the most electricity, on hot sunny days when air conditioning is working overtime. And it doesn’t produce when power usage typically is lowest, at night. But how much is too much? At what point do efficiencies and customers producing their own power become a financial liability rather than a long-term benefit? “It’s a question we get asked a lot,” Sahling-Zart said. The answer varies from company to company, she said. Most utilities have a limit on the number of customers producing and selling electricity back. State statutes say Nebraska utilities have to allow up to 1 percent of their average monthly peak. “For Lincoln Electric System, we’re a long ways from that,” Sahling-Zart said. Solar systems are just catching on in Nebraska compared with many other states, primarily because electricity is relatively cheap here compared with places like California where solar panels are much more popular, she said. More solar panels get built when there is financial incentive, just like people start riding bikes and carpooling when gas prices go up. “But we do have a growing number of customers who do it because it is the environmentally responsible thing to do, regardless of cost,” Sahling-Zart said. LES allows electric generation projects up to 100 kilowatts. No one has built a system larger than 25 kilowatts yet, but a couple of businesses are considering it, Sahling-Zart said. But solar’s runaway success could be facing a cliff. Federal tax credits of up to 30 percent come to an end in 2016. Unless Congress acts, the tax credit will fall to 10 percent for businesses and zero for residential customers. Proponents like Cliff Mesner, a property developer in Central City, still have hope. The future of solar depends on showing people it can save them money, he said. Mesner, who has solar panels powering his home and office, got several Central City businesses and the city-owned utility to help develop Nebraska’s largest solar array. The 200-kilowatt system consists of 800 panels in an abandoned parking lot. He sees a bright future for solar as panels and batteries to store electricity become more efficient. “I think solar arrays are going to be popping up the way people are using cellphones and iPads right now,” Mesner said. Reach the writer at 402-473-7304 or nbergin@journalstar.com. Follow him on Twitter at @ljsbergin. The Butler County Board of Supervisors went on the record Monday in regard to recent regulations passed by six townships to restrict wind farm development. Lincoln Electric System is hedging its bets by encouraging customers to put up solar panels as talk of sweeping environmental regulations looms.